It was 6.30 AM when I woke up and realized that thankfully, all three of us slept well with no signs of AMS at all. As I looked out of the window, to my surprise there had been a mild snowfall at night with lawns and gardens wearing thin white sheet of snow. There were still dark clouds in the sky but cold was bearable. Plan was to leave by 8 AM for Sham Valley tour and we all were ready by 7.30 AM. These were good signs as none of us was lazy waking up and equally excited to explore the heaven. By the way, water was bone chilling in the washroom but we still managed or rather had to manage 😉 … I called up Rigzin and asked him about whereabouts and he told us that he is on the way. Within 10 minutes he was nocking at the door which meant we would be having breakfast on the way, may be Nimmu. Filled with fervour, we jumped into the car by 8.15 AM and were off to Sham Valley which includes Alchi, Likir, Basgo, Zanskar and Indus Confluence at Nimmu, Magnetic Hills, Gurudwara Pather Sahib… Gosh, a long list but they all are very much close to each other, about 160 KMs of drive for the complete tour and back to Leh. Weather had cleared up a bit and there was sunshine but still dark clouds were scattered in the sky. We headed west along NH-1 i.e. Srinagar – Leh Highway At Phyang diversion the taxi union guys stopped us and asked Rigzin to present the slip from the union. 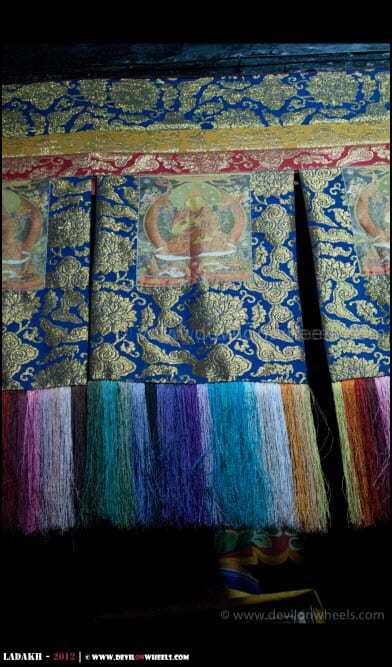 However, Rigzin had not taken it yet and had plans for taking it today for the rest of the tour. Somehow, he managed them and also told that last day the ADC came at 5.30 PM in the evening 😯 , thank god we left early. Anyways, we were running on the smooth tarmac with diversions in between where work was in progress. Vistas were just majestic with some super views of Stok Kangri range and the Indus Valley View from view point was purely awesome. 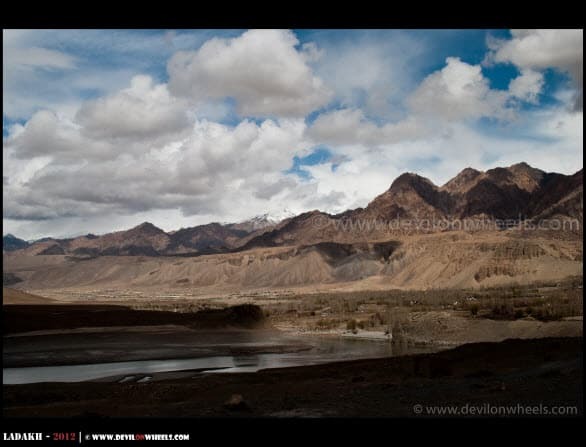 Soon we reached Magnetic Hills, about 30 KMs from Leh at an altitude of 11000 Feet approximately. 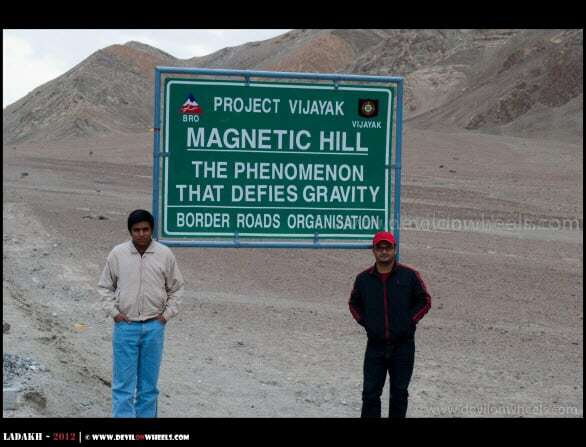 Magnetics Hills, a phenomena that defies gravity. 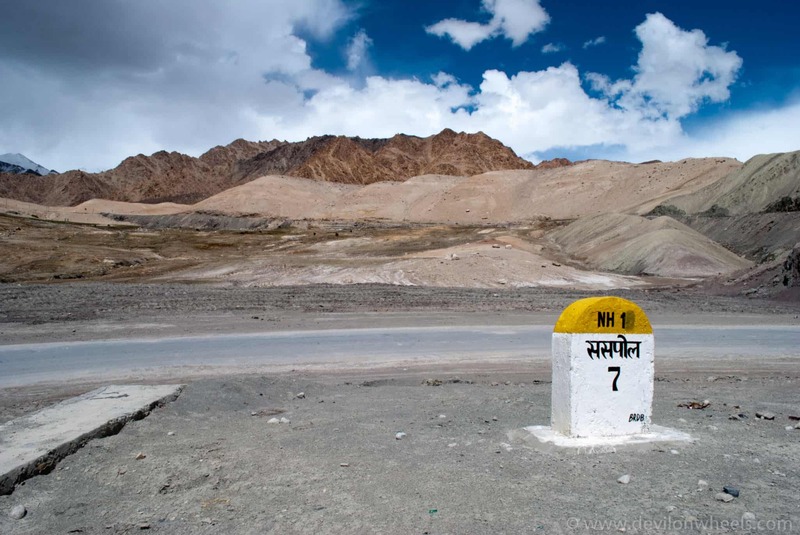 It is believed that the Magnetic Hills have magnetic properties so strong to pull cars towards it. Rigzin put the car in the marked box and placed it in neutral gear and voila!! the car started climbing. People say it is nothing but an optical illusion, we could not judge it because the car was actually going upwards in the direction of Magnetic hills. May be a ball will be useful to judge the situation. If the ball also goes towards the hills then certainly there is nothing but an illusion that projects a descending road as ascending road 🙂 … We had some photos and were off towards Nimmu. 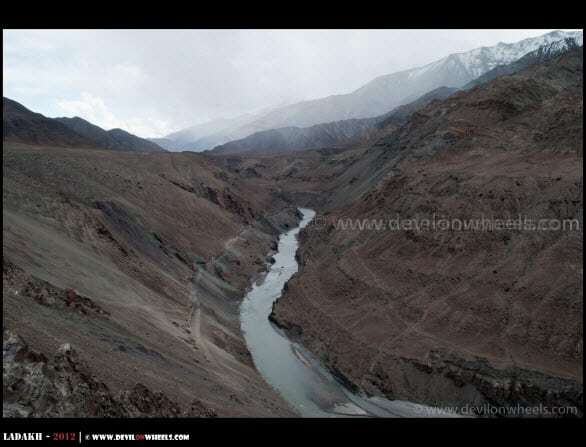 Soon after Magnetics Hills comes the point called Sindhu Darshan, where you can see Indus river in full glory between the hills and soon after comes the Zanskar and Indus River Confluence just before Nimmu Village. We checked it and decided to visit it on the way back near the shores, where a complex is being developed, guess for tourists only. We reached Nimmu and decided to have breakfast at a shop on the road. Puri Chole and Allo Samosa was available to our surprise and we quickly ordered them along with Tea. They tasted great and we had smiles on our face because expectations was nothing more than average food to fill the tummies 🙂 … All this for just Rs 50, we could not believe it but that is Ladakh for you… We headed towards Alchi and on the way saw the longest Mani Wall (about 600 Mtrs) just at the exit of Nimmu Village. 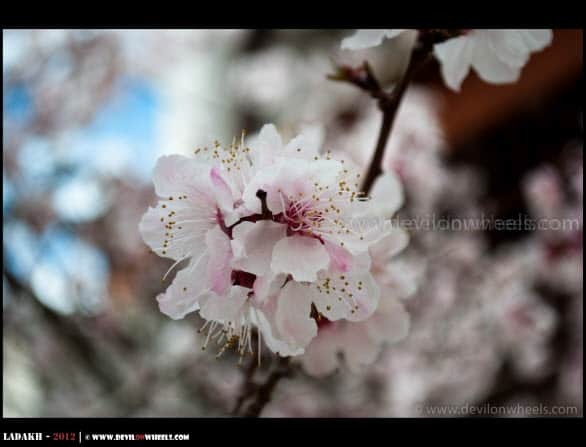 Apricot tress were blooming in pure colours in the whole valley and it was delight to see them. Roads were in bad state where ever it was affected by flash floods of 2010. We reached Basgo where these trees were in fully glory, looked majestic and we decided to visit the ruins of Basgo Palace on the return. Time to head straight to Alchi leaving behind the diversion of Likir Monastery as well. At Sasapol, there comes a bridge named by Alchi bridge from where you take left and goes towards Alchi village. 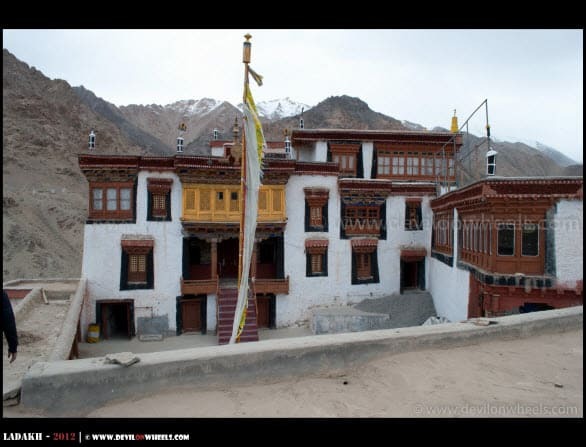 About 65 KMs from west of `Leh and about 3100 Mtrs of altitude, Alchi Monastery is one of the oldest monasteries of Leh and have monuments and scriptures dated as old as 10th century. We bought the oil and light to be offered in the monastery and headed down to monastery which was so calm and peaceful. Really enjoyed our time in the monastery with mild snowfall making it more delightful. The time spent brought me more close to Buddhism and sense of peace it offers to one’s soul, remarkable!! 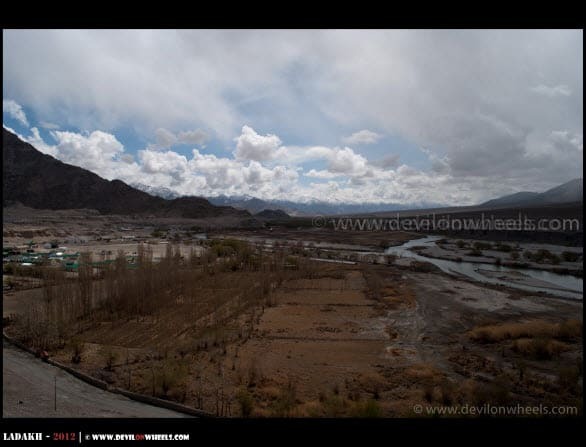 You can walk down to Indus River as well from the back of the monastery and spend sometime along the river. 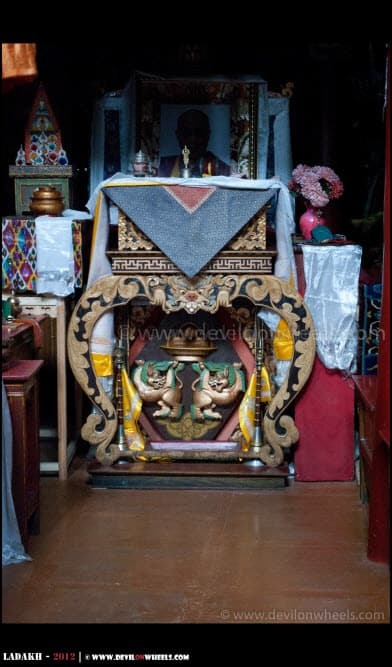 There are camps “Sumtseg Camps” run by Alchi monastery where you can stay as well. After taking some pictures of the complex we headed back to parking place where we had some biscuits and tea. Weather was cold as there was still mild snowfall kissing us, elevating the feeling to further extent. 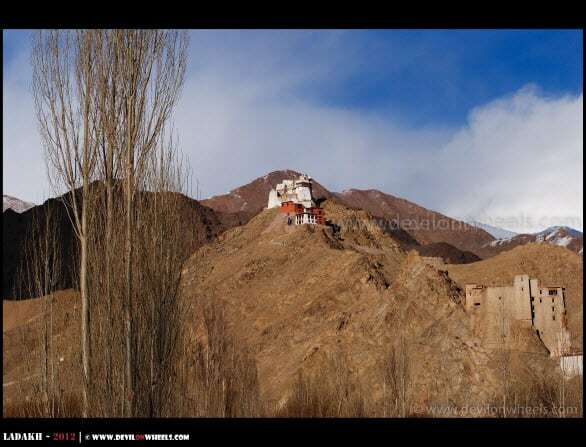 It was time to head to Likir Monastery As you go back towards Leh crossing the bridge at Sasapol, about 10 KMs later you will see a diversion towards left going to Likir monastery. 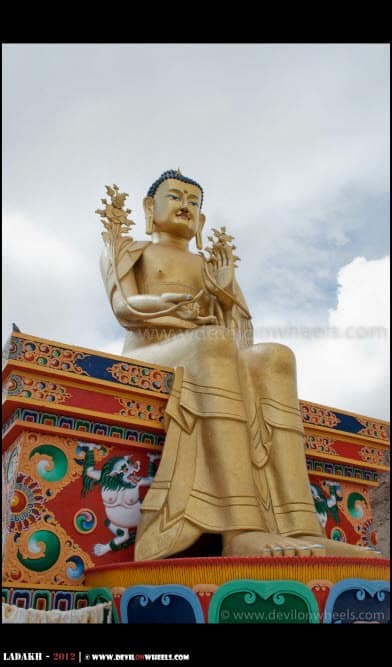 About 52 KMs from Leh, Likir Monastery was built in 11th century and was again re-built in 18th century and houses a 25 feet Lord gold covered Buddha Statue. It was tough to climb the stairs with un-acclimatized body but we managed. Wind was so cold on terrace but views every penny worth the effort from the top. I was running after a bird but could not capture it in camera 🙁 … So, giving up after loss of breath I decided to sit near by statue of Buddha. I was amused to see the models created with butter which do not melt. Locales say those who have created it had powers in their hands that is why these models does not melt. Amazing Art!! Time to leave towards Basgo Palace. As we were going through towards Basgo, there comes a stretch straight as an arrow, which looks beautiful and many advertisements have been shot around this place. We also could not stop us and decided to shoot some pictures and enjoy the place. It was fultoo fun with running around, sitting on road, lying on it and what not ;)… I got some amazing shots of the trip at this place. Soon we reached Basgo Palace where again seeing the stairs, I was like “Ahh.. Not again!!”. But, slowly, slowly explored the place as no one was around, even the monastery was closed. Some shots of movie “Dil Se” was also shot here. Basgo Palace rather ruins of Basgo Palace, is about 40 KMs from Leh and approximately 500 years old built for Namgyal rulers. We left the place, distributed some Poppins to children in the village and headed to Nimmu for lunch. At Nimmu, this time we ordered veg. chowmein and thukpa plus momos. It was nice, tasty and fresh!! Rs 170 for four was all that we paid. 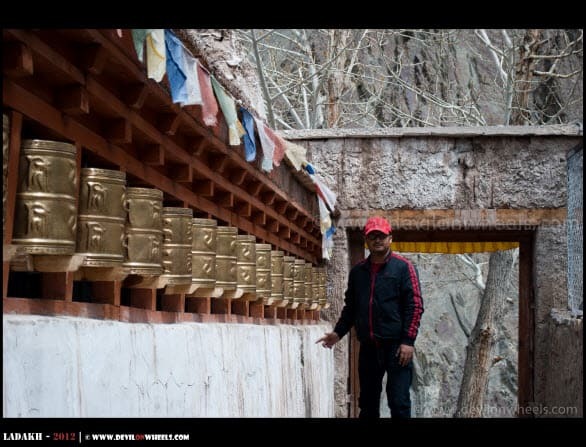 Great blog dheeraj bhai, if we start early from kargil, say 7 a.m. can we do sham valley, ex cluding likir and alchi, and up to chilling and reach leh before sunset. Farogh, very easily. 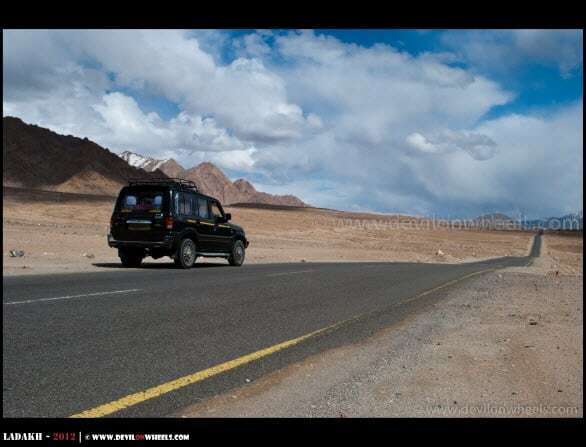 In fact Alchi is just 5-6 KMs from the Highway, so you can do that too. So, how much time it will take only for Leh- Alchi- Likr- Leh trip on the next day with a Leh Reg Cab? Soham, you are correct in your understanding. 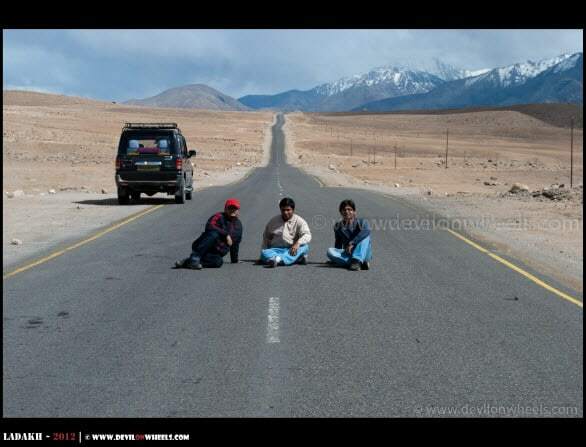 Alchi and Likir fall off the route hence you cannot visit them in outside ladakh taxi as per rules. 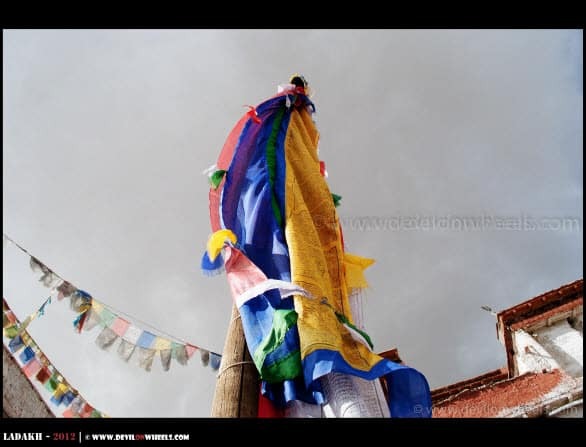 Unless you are too much into monasteries, it isn’t necessary to come all the way back for Alchi and Likir I will say 🙂 🙂 … Still, you want, it will take up half your day for sure. In your most common itinerary , You have mentioned of this sham valley /rest day right ? How long does this sham valley excursion take ? It will take about 5-6 Hrs of complete Sham Valley trip including decent amount of breaks at Alchi and Likir. 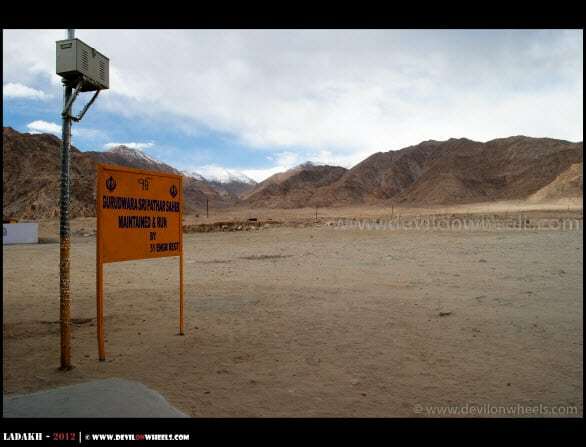 Does way to khardungla pass stay closed after 12:00 hr? I mean is it operational in one direction only? Also I read somewhere it stay closed on Monday? Ok sir ! Thanks a lot for information sharing ! I enjoyed. want to go there soon. Yes sir found ur all replies. Thanks for replying so nicely to all requests. Heavenly indeed. It's such a treat to even see these superb pictures from that side. 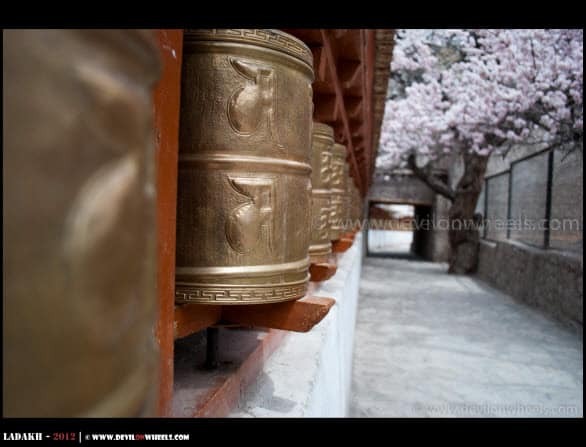 I first hear Om Mani Padme Hum when I visited Nepal in 2005. I could listen to that all day long. Honest. 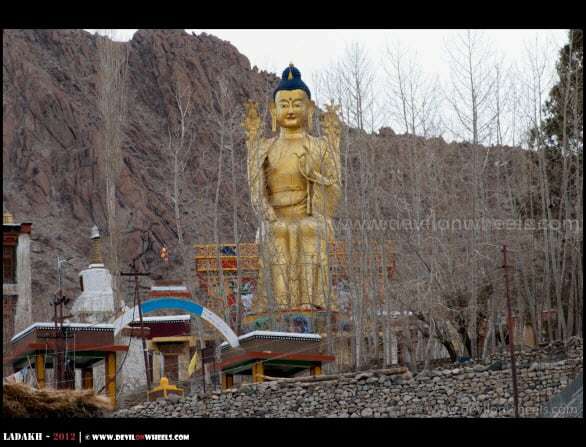 Thanks alot and Yes, indeed when one goes to Ladakh then he/she must visit this beautiful and spiritual Sham Valley. A different feeling and experience altogether. The words are just magical "Om Mani Padme Hum". Wonderful coverage of the place with beautiful images. No Joyita, you do not need any permits for Sham Valley. Thanks for the update…for the sham valley trip how much is the charge for the rented taxi with driver.what kind of taxi is provided as it is a high altitude area?? 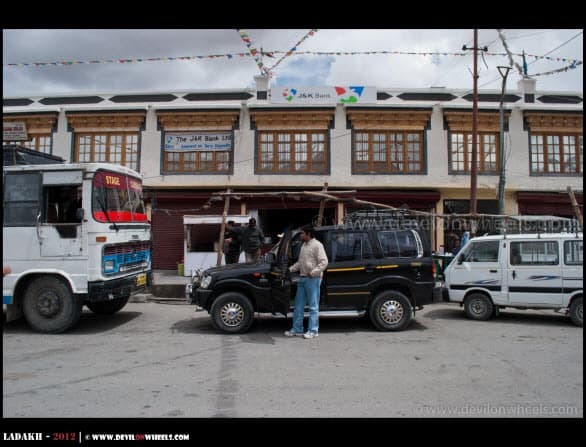 For the current leh – ladakh taxi union rate list 2012-13 including the contacts of some reliable taxi drivers within Leh – Ladakh, check the link here. You can get about 12-15% of discount by directly getting in touch with drivers and of course, talking in person rather on phone always help in bargaining more. 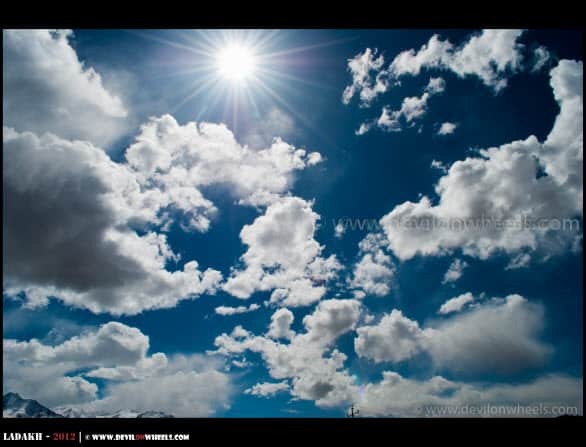 I was going through this blog…i just loved it and also included in my itenary. 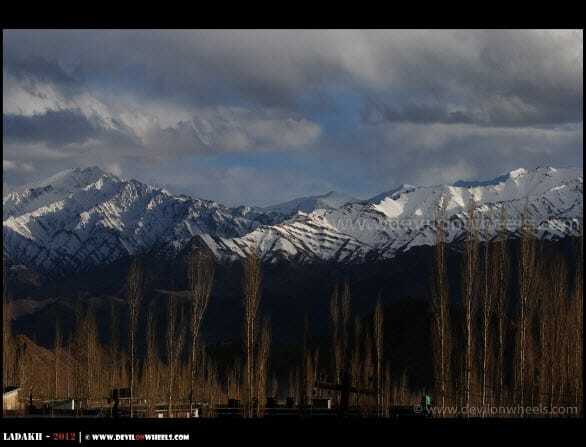 i am going this month end to leh and it is group tour through cox and kings.may i know how is the weather thr and do i have to carry heavy woolen garments…heard news that there was a landslide recently…how was the weather when you visited thr… please do let me know exciting places thr. 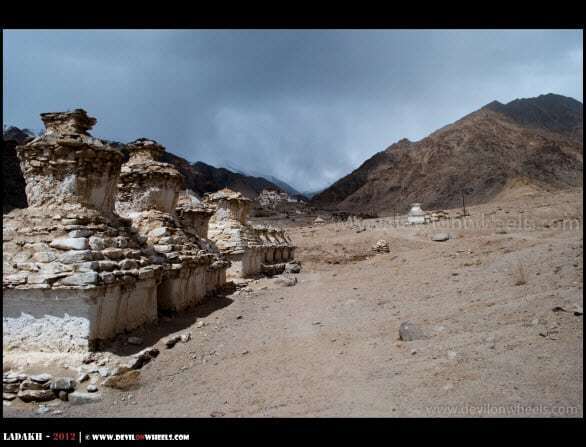 I will suggest you go through the places listed in the article here: Most Common Itinerary for Leh – Ladakh. I hope this helps. 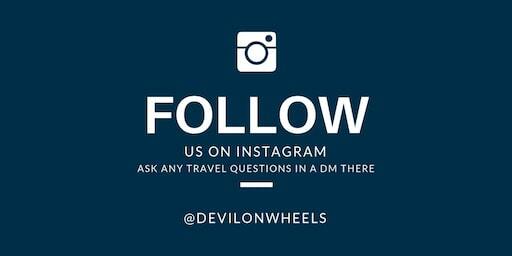 Please let me know in case you have any doubts or queries. 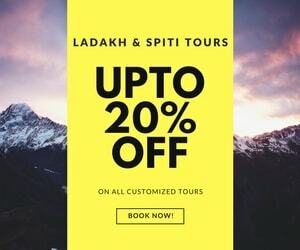 I guess you have booked with some tour agency, they might have covered the local sighseeing as well as your trips to Nubra Valley and Pangong Tso. If you have time then you can visit Tso Moriri lake too apart from above mentioned for Sham Valley. Are permits required to go to Sham valley ? No Laukik, you do not need any permits for Sham Valley. 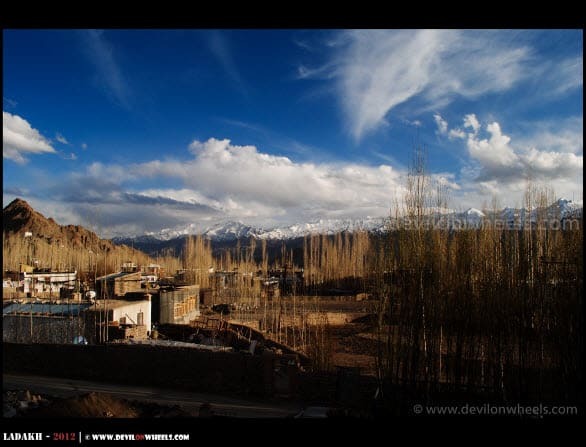 Yeah Bob, there is no other place like Ladakh on earth 😀 … Stay tuned for some more heavenly pictures especially in the coming few days. wow!!!! What slip did you need? And I loved the Sindhu darshan pics and info..that is so exquisite. Loved the monasteries too…what a journey! Thanks alot Bhavana!! The slip required was for taxi. The taxi guys had to get slip from Taxi Union (tourists shall not other about it) to ensure that they are not operating on their own. 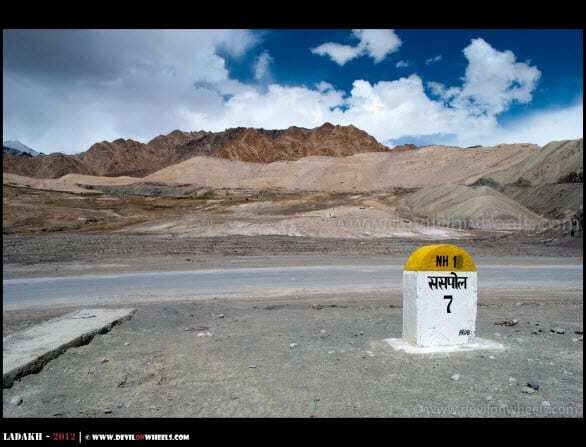 So, these check posts are placed at the exit route from Leh, to ensure all taxis carrying tourists have informed about the bookings at Taxi Union office of Leh and had their slip for it. 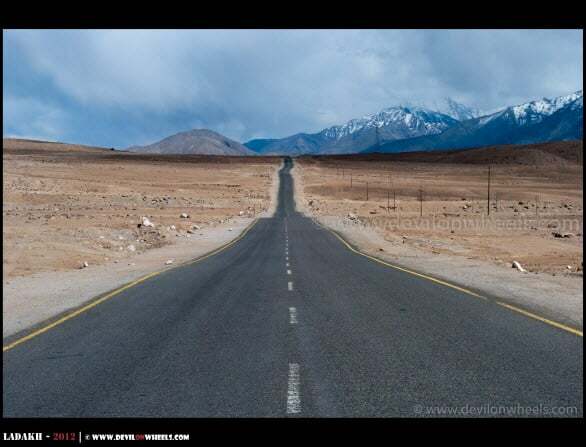 Can't wait for your Hanle and Tso Moriri trip…..
thanks alot Samaresh. Indeed it was a great trip. I use kit lens 18-55 and 70-300 AFS both of them Nikkors on D3000 body. Learning the skills with each of the trip :)… I wish you too soon visit this heavenly place.